USB Safeguard is a lockdown application designed specifically for helping you create a password-protected virtual drive where you can store sensitive files using the 256-bit AES encryption algorithm. 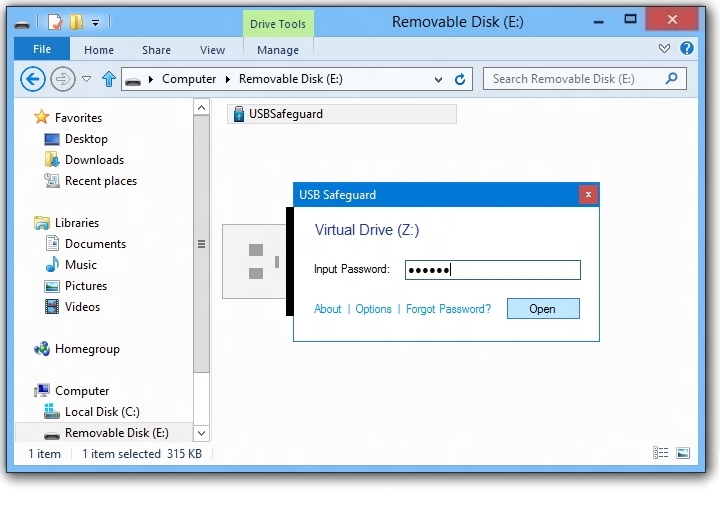 The virtual drive can be placed on your portable storage devices, such as USB flash drive, HDD, SSD, or memory card. Given the portable status of this utility, you can get rid of it by simply deleting the files that you have downloaded from the Internet. In addition, you may store it on any portable media devices and carry it with you. The application does not leave entries in your Windows registry and write configuration data in your computer. When you run USB Safeguard for the first time, you are asked to format the drive before running the program. You should perform this step in order to make sure the tool works correctly and the virtual drive is installed smoothly. You can protect the virtual drive by setting up a master password. A hint may be added for helping you remember the password in case you forget it. The GUI is minimalistic and is designed only for allowing you to input the correct password and gain access to your files. In addition, it hides a few configuration settings under the hood which can be used for selecting the preferred drive letter from a drop-down list, automatically closing the virtual drive after a custom number of minutes of inactivity, as well as automatically closing the drive via a hotkey (CTRL + ALT + the current drive letter). All things considered, USB Safeguard delivers a simple and efficient software solution for helping you keep your private files in a password-protected virtual drive, and can be mastered by all types of users, regardless of their experience level. Submitted by:USB Safeguard, Soft. USB Safeguard, Soft. Disclaimer: Pressbox disclaims any inaccuracies in the content contained in these releases. If you would like a release removed please send an email to remove@pressbox.com together with the url of the release.